I really enjoyed Night School so I was excited to get my hands on a copy of the sequel Legacy and couldn't wait to see what would happen next in the story. After the revelations made at the end of the first book I was really interested to see how things would play out for Allie now she had learnt some of her family secrets. She certainly had an unusual introduction to life at Cimmeria Academy over the summer and the start of the new year looked set to be just as explosive. I can't fault the opening to Legacy, action packed and fast paced I was on the edge of my seat desperate to see how Allie would get out of the situation she had found herself in. Unfortunately once she arrived at the Academy I felt that the plot really slowed down and I ended up disappointed. One of the things I loved most about Night School was how action packed it was but Legacy felt much more character driven. That isn't necessarily a bad thing but I like some kind of plot to go along with the character development. In this case very little actually seemed to happen, everyone continued to keep Allie in the dark, she got practically no more information about her family or what was actually going on and why Nathaniel was so determined to plot against the school. By the end of the book I don't feel I have answers to any of my questions and I was left feeling frustrated. I was also shocked at the behaviour of some of the characters, it seemed like Carter and Sylvain had completely switched personalities from the first book. I loved Carter before but in this instalment he was a complete idiot and the way he treated Allie made me so angry I wanted to punch something. On the other hand Sylvain, whose actions in the first book are still completely unforgivable, has turned into a really nice guy. I was shocked to find myself liking Sylvain and I did actually start to believe that he was sorry for the things he did before but in my mind that doesn't make them any more excusable and I still have a hard time letting that go. Unfortunately Legacy definitely suffered with second book syndrome for me, I hate to give negative reviews but I was so bored that I almost stopped reading. The book is nearly 400 pages long and practically nothing happens, the only thing that kept me going to the end was my love for the first book. The main element of the book is relationship angst between Allie, Carter and Sylvain which is something I just wasn't interested in reading about. If it hadn't had such a major focus it wouldn't have bothered me but I found it all too much. After the action packed beginning you really have to wait until the last 20 pages for anything to happen and then I felt things were rushed over too quickly and we missed out on a lot of potential excitement. I don't want to put people off reading the story because I definitely seem to be in the minority with this one - a lot of other bloggers have been giving it very high ratings. I have to be honest with my reviews though and tell you how I really feel about the books I read or there is no point in me even writing reviews in the first place. I'm sure I will pick up the next book in the series, I have so many unanswered questions about everything and I do really like Allie and want to know what happens to her. I just hope that I enjoy the next book as much as I enjoyed Night School. It sounds like there is / was so much potential for this book - especially after the fab first book, it's a real shame the 2nd didn't live up to your expectations. 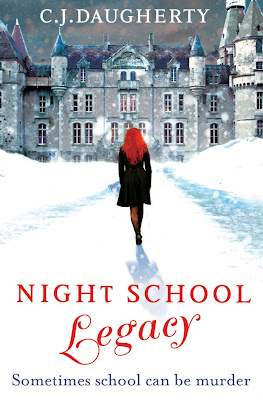 I'm still going to read Legacy as I really enjoyed Night School but might lower my expectations of it just in case I feel the same! I definitely seem to be in the minority with this book though, nearly all of the reviews I've seen have been really positive so hopefully you'll enjoy it!